Jack Gardner’s Cleaner to Controller was published in 1994 in our now well-established &lsqou;Reminiscences’ series, and is now out of print. As a result, correspondence flowed in from all over the world. All of this helped to stir Jack’s incredible memory even more. Looking back over the period covered by this book, it seems that although the travelling public and freight customers might only have viewed the railways as a service industry it was the corporate pride demonstrated by most railwaymen that made them into a valued institution. Jack had followed in his father’s footsteps when he joined the Great Western Railway in 1934, steadily working his way up the promotion ladder. A long apprenticeship ensured that his handling of locomotives was almost intuitive with the safety of all as his over-riding concern. In such conditions footplate crews depended upon mutual trust and team work to create and control the power of the steam locomotive. 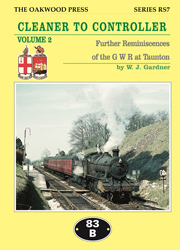 Taunton was a busy junction in those days with services to Barnstaple, Chard, Minehead and Yeovil as well as ‘Stars’, ‘Castles’ and ‘Kings’ on West of England main line services. Jack was there to see the new generation of diesel-hydraulic locomotives of ‘Western’, ‘Warship’ and ‘Hymek’ classes that arrived in the 1960s as their replacements which were destined to have much shorter working lives. Some would claim that by the time Jack had begun his footplate career the railways had already begun to decline; but thanks to the Great Western publicity machine of the 1930s it is still possible to view this period as a ‘golden age’. Certainly the Second World War and then the Summer Saturdays of the 1950s created levels of rail traffic that have never been exceeded and so Joack’s memories recall a period when the railways were at their busiest. Sadly for his family and his many friends Jack Gardner died in 1995. His written accounts of his railway career will serve as a legacy for future generations. A5 format, 176 pages, 120 illustration.